TB Online - AstraZeneca vs. NTDs: Does profitability win out? 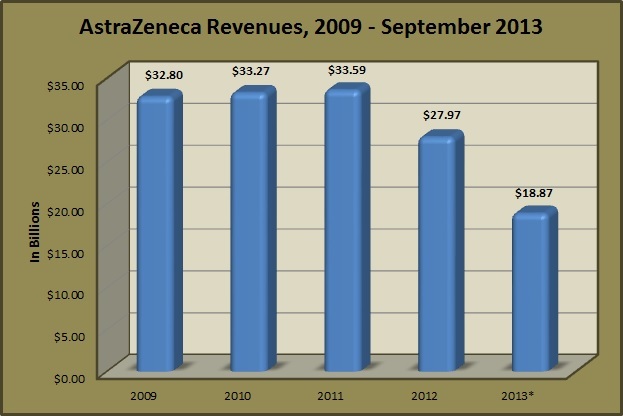 AstraZeneca vs. NTDs: Does profitability win out? What makes this closing unfortunate is that it indicates a cutback in endeavors to support the commitment AZ had made in 2011 when it became a founding member of the World Intellectual Property Organization (WIPO) Re:Search initiative. The initiative is aimed at promoting research in neglected tropical diseases (NTDs), tuberculosis and malaria. There is little doubt that the closing of the site in India, as well as the refocusing of AZ's R&D in general, is prompted by the reduction in revenues the Company has experienced over the past two years. According to AZ executives, the decrease in revenues is due largely to the expiration of patent exclusivity on several of its drugs recently.8 The decline in revenues is shown in the this chart (Note that 2013 revenues are provided only through 3Q13). Respiratory, inflammation and autoimmunity issues. Accordingly, an examination of their most recent development pipeline list shows products in various stages of development, with the predominance being in the three areas cited. Drugs for neuroscience and infection, while still included, are apparently being deemphasized.11 That being said, AZ still presents an impressive pipeline that would appear to be ready to bear considerable fruit by 2017. Is AstraZeneca claiming that its time and efforts are better served making more profit than in actively promoting humanitarian causes that may involve less profit? Is Bangalore the only "cut" it is going to make in its commitment to Re:Search, along with its stated intention to eliminate "early-stage" research in NTDs, tuberculosis and malaria? How much support will be given to the agreements, collaborations, and associations AZ has made through WIPO and Re:Search? To what extent are these "expendable" when profit is on the line? It is completely understandable that a company insure its profitability, and assign profitability a more urgent priority than unprofitable ventures (no matter how humanitarian those ventures may be), since only by operating profitably is a company able to commit itself to extraneous operations. But how "profitably" must a company operate? This is not a situation where AZ had to choose between making a profit and taking a loss, but where the Company stood to earn a few billion less in profits than a few years ago - although it is still making net profits in the billions. What is perhaps most saddening is that AstraZeneca is relinquishing the leadership position it had assumed when it became one of the founders of Re:Search. AZ has reaffirmed its commitment to the dividends it pays to shareholders.12 Too bad it can't make that same reaffirmation to the initiative it helped found. This article is for informational use only. It is not intended as a recommendation or inducement to purchase or sell any financial instrument issued by or pertaining to any company or fund mentioned or described herein. Before investing, readers are reminded that they are responsible for performing their own due diligence; they are also reminded that it is possible to lose part or all of their invested money. All data contained herein is accurate to the best of my ability to ascertain. All opinions contained herein are mine unless otherwise indicated. The opinions of others that may be included are identified as such and do not necessarily reflect my own. 1 Reported in India Times, 1/31/2014. 3 AstraZeneca press release 4/12/2012. 4 AstraZeneca press release 8/14/2012. 5 AstraZeneca press release 6/2/2003. 6 AstraZeneca press release 06/28/2010. 7 Reported in India Times, 1/31/2014. 8 AstraZeneca Earnings Call Transcript Q3 2013, 11/1/2013. 10 AstraZeneca press release 10/31/2013, and India Times, 1/31/2014. 11 PDF download of pipeline candidates available here. 12 AstraZeneca Earnings Call Transcript Q3 2013, 11/1/2013. Published: Feb. 5, 2014, 11:09 a.m.
Last updated: Feb. 5, 2014, 12:09 p.m.